Large modern chalet Peisey-Vallandry Les Arcs in Paradiski. Rental chalet 6 bedrooms for 14 people, in Peisey Nancroix, typical village at the door of the National Park of Vanoise, and in the heart of the great Paradiski ski area, connecting the resorts of Les Arcs and La Plagne in Savoie Mont Blanc, in the Alps . Beautiful contemporary chalet with panoramic views, very well located 350 m from the ski lifts, you will enjoy after skiing a relaxing time in the sauna, billiard room or one of the lounges. Chalet ideal for reunions with family or friends, summer and winter, there are numerous activities for visitors to the mountain successful. Living room, kitchen, 6 bedrooms, 5 bathrooms, 1 bathroom. Equipped with dishwasher, washing machine, dryer, TV, stereo, terrace, balconies, garden, sauna, spa, pool, parking. With its photovoltaic plant of 35 m², by renting this cottage you contribute to the production of renewable energy. Eric was friendly, efficient and helpful. We were a group of 11. Accommodation was excellent, well equipped, clean, modern, ideal for our group of 8 adults 1 child and 2 late teenagers. The ski lift was about 5/6 minutes walk or 1 minute drive to small car park, we used to transport skis and boots down to car park by the lift to make it easier. Walking wouldn't have been a great problem. Small bucket lift then took you straight to the Vanoise express station to ski into either Le Arcs/Villandry or La Plagne. Village was a bit further about an extra minute with friendly bar/newsagent/simple restaurant. Another restaurant in village appeared to be full every night so book early! Also butchers, bread shop and small supermarket in village, everything you need. Shame bucket lift shut at 5:50 or apres ski in Peisey Villandry would have been possible but bar in Peisey Nancroix was good fun. Overall great chalet, host and location, suited us very well. Thank you Malcom, it was a pleasure to welcome you. Eric was super helpful, easy to talk to (and prompt in replying) and has a great chalet. We really enjoyed the stay and Le Villaret feels more like a charming village than a resort town. It's a 5-10 minute walk to the small lift that takes you up to Plan Peisey and the chalet can be skiied down to with a bit of off-piste navigation. Great chalet, there were 9 of us, 3 families and we had plenty of space. The kitchen was really well equipped and the views fantastic. We had a great time and although the walk to the first lift took just over 5 mins, it was all down hill, once on it you are straight up to the ski slopes. We were greeted by the owner who was really helpful and informative and available if needed. The property is well maintained and clean and we certainly b no hesitation in recommending it. We rented the house for a cycling trip in the Alps for 6 adults for a week in June 2014. Because of the good price and accommodation ratio, we selected this house. With a good accommodation I mean the great kitchen, living room, view from the balcony, place to store our bicycles, WIFI, 6 separate (double) sleeping rooms with each his own shower or bath and even a sauna, the house fulfilled all our expectations. The owner speaks very well English which makes it a lot easier to communicate. The overall condition of the house is good, also because of the relative young age of this house. So for a stay in the Alps nearby Bourg St.Maurice for a cycle trip, MTB or hiking, for sure I can recommend this house. And I can imagine that this also will be the case for a stay in the winter. For us the central place between the col d’Iseran, Col de Madeleine, Cormet de Roseland, Petit St.Bernard and many other smaller climbs, this was a good location. One point of attention is that you most of the times have to descend first towards the valley and park your car or bus over there. Otherwise you have to climb back from about 700 m in the valley towards the house at 1350 m height at the end of every trip. This is good for doing ones, but not for every time. But this should not be a surprise because the house is situated in a skiing area. The place Peisey-Nancroix is a small village with a bakery and a café, but don’t expect a wild night live. But after cycling the whole day, you don’t want that anyway. In Bourg St.Maurice there is more action, café’s restaurants and shopping facilities. And along in the valley of the river Isere, you can also have a nice break at one of the Rafting clubs. And in the period we stayed there, most of the times the weather was nice (between 20 and 25°C at noon) but also some rain but most of the times in the evening or night. So as you can read, we had a very nice stay which I can recommend everyone. Deze chalet kunnen we zeker aanbevelen. Is goed gelegen. Via de voetgangerslift, die op wandelafstand ligt, kom je aan de Vanoise Express dat verbinding geeft met Les Arcs en La Plagne. De keuken is volledig uitgerust. De chalet is ruim, praktisch ingericht en gezellig met de afzondelijke tv-ruimte. De pooltafel is ook een aangename surplus als avondanimatie. De eigenaar heeft ons warm onthaald en gaf goede tips en informatie. Ook bij vragen stond hij steeds tot onze dienst. De eigenaar heeft ons warm onthaalt en gaf goede tips en informatie. Ook bij vragen stond hij steeds tot onze dienst. In Tarentaise, in the heart of Paradiski area linking Les Arcs and La Plagne and at the door of the Vanoise National Park. 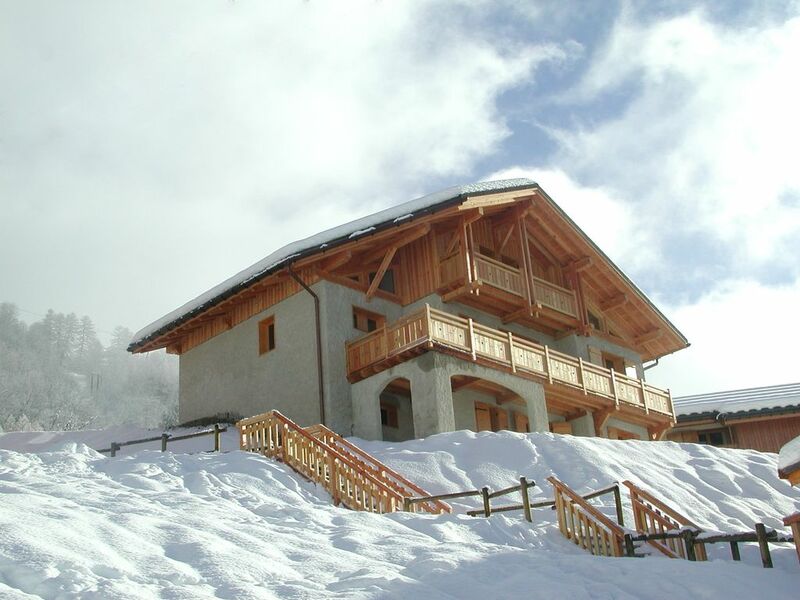 Ski: Chalet located 350 m from the ski lift for access to Plan Peisey snow front.